Fusion GPS is claiming to be upset that the names of their sleazy, criminal employees who were involved in the political hit on President Trump are being released. Get used to it boys, court records are public too. The smear merchants who fabricated the Trump dossier for the Democrats to use against the incoming President Trump have accused Senator Chuck Grassley of endangering their employees by failing to hide their identities despite multiple requests. Maybe the juvenile delinquents haven’t yet learned that sometimes the answer is simply “no,” and you don’t get what you want. Grassley isn’t one who takes kindly to being dictated to and multiple demands for the same thing isn’t going to enhance one’s prospective outcome. Maybe they shouldn’t have tried to take down the President if they were concerned about being discovered. Lawyers for Fusion GPS wrote a letter to Senator Grassley in which they stated that their client had twice reported unspecified threats to the police and had attempted to keep the identity of their sleaze ball employees a secret “because of well-founded concerns about their public safety.” The letter also criticized RINO Senator Lindsey Graham for revealing the truth. The attorneys for Fusion GPS stated that the names of the employees were contained in six letters sent last week by Senators Grassley and Graham on behalf of the Judiciary committee despite the company’s lawyers having “on multiple occasions” asked committee staff members not to do so. In the commonplace denial of self-responsibility that lawbreakers often seek to utilize as a means of assigning their own blame to others, the attorneys wrote, “Ignoring our requests, your office knowingly put these people in danger, by releasing their names to the public.” They declared, “These leaks are unauthorized and unethical.” Aren’t all leaks unauthorized and unethical by definition? First of all, if they were involved in preparing this sleazy collection of garbage for use in the subversion of our election and President they are not good people. Secondly, they should have thought of their own children first and maybe chosen a different line of work, something legitimate perhaps. 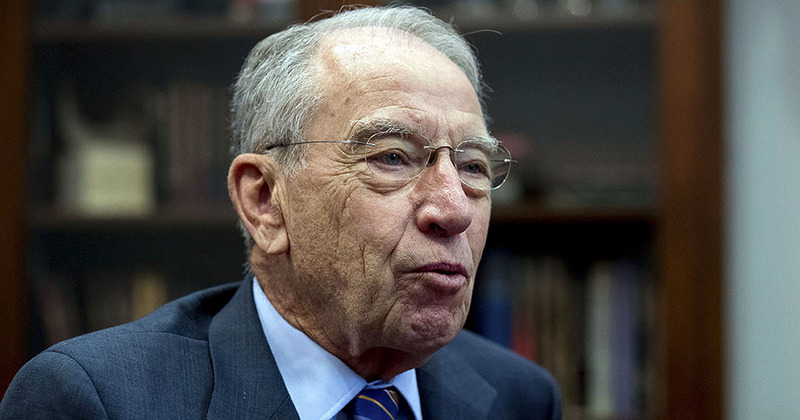 The lawyers also accused Grassley’s office of leaking confidential information that it obtained from GPS founder, Glenn Simpson. Maybe they were thinking of Grassley’s counterpart on the Judiciary Committee, Ranking Democrat Dianne Feinstein, who claims she released Fusion GPS founder Glenn Simpson’s transcripts without alerting Grassley because she had a cold. A Judiciary Committee spokesman said the letter contained “a number of inaccuracies that misrepresent the facts.” Of course they do. What else would you expect from those defending the fabricators of the inaccurate and misrepresentation-filled dossier? When they’re desperate the Democrats will attack on all fronts and they’re becoming very desperate at the truth gets closer to coming out. Maggots wriggle and squirm when doused with hot water. what the real deal is, ALL OF THOSE SCUMBAGS GOT CAUGHT IN THEIR OWN TRAP. SO NO MERCY FROM HERE, CAN’T DO THE TIME, THEN DON’T COMMIT TREASON AND CRIMES TRYING TO TAKE DOWN OUR DULY ELECTED PRESIDENT. now it’s TIME TO PAY THE PIPER.